Sometimes I'm just overwhelmed by our consumer culture. I've been known to stand in supermarket aisles dumbfounded by the infinity of choices one can have for the most mundane things, like say breakfast cereal or chocolate chip cookies. But, every once in a while our mad dash off the cliff of compulsive consumption gets slowed down just a tiny bit by some wondrous, albeit probably completely unnecessary object that either makes you smile at the whimsical sensibilities of whomever thought that said object was worthy of manufacture, promotion and wholesale export (probably from some Communist third-world country, meaning most of the people making it are either political prisoners or earning the equivalent of about two weeks of our average wages per annum), or laughing out loud at the idea of actually purchasing said object, thus justifying Some Marketing Genius' estimation of our unconscious desire/need for all manner of ludicrous things. Yes, my friends. 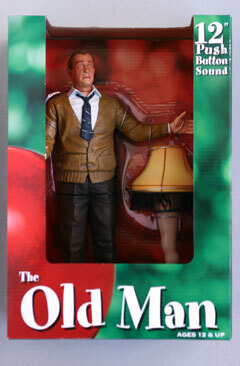 Something you've all secretly been waiting for, but just didn't know it until somebody else figured it out for you -- your very own, fully articulated, 12 inch tall, talking Darren McGavin action figure from the move "A Christmas Story", complete with mannequin leg lamp! I hesitate to consider what "tapestry of obscenities" may issue from his little tinny speaker, but what I really wish is that someone will create an accessory kit, complete with rumpled sports jacket, spiral notebook and porkpie hat, so that you could convert this into a "Kolchak: The Night Stalker" action figure. And of course, for those of you who aren't content with a little-bitty 8 inch tall leg lamp, you can always spend your hard-earned disposable income on one of these beauties. Now, who says we don't live in a great country?